Forest end interest in Watson.. | Through the seasons before us..
Hello nffc and fellow reds ,first post for me this season good to read all the optimism that sourrounds the reds at mo.We have made some decent signings and from what ive seen are playing better football ” forest football on the deck touch and move” . The club seems more stable which is what we need ,longer contracts, seeing the bigger picture is not always easy but we have too as loyal fans.An above halfway finish will be a massive boost for us this season.Then the big push i dont think you will recognise the team this time next year if smoulds deliversWe have real firepower in the team now and nothing to be scared of.from this leage its all about being positive football is all about confidence lets just hope forest fans dont get on the teams back its very damaging. Keep up the good work nffc your still the best on things forest as you are a loyal red. Come on u reduns !!!!!!!!!!!!!!!!!!!!!!!!!!!!!!!!!!!!!!!!!!!!!!!!!!!!! While dissapointed we’re not going after Watson who is a player I have liked the look of for a couple of years now, I am glad we’re not going after other targets. It will stand us in good stead to have that 2m in the back pocket ready for the January sales – when more players on the fringe of Premership action may be looking to move on when pre-season promises have not been kept. What happened with the German(?) kid we had on trial? Has Stephen Hughes gone anywhere? Why not offer him a week-to-week or pay-as-you-play deal until Jan? I don’t agree that our spending is over. We are still short in places that’s for sure, Hughes is not coming to the CG as things go & the German trialist wasn’t in the game as expected. I fear we need a little more Championship experience to push us onwards. Our squad is good but a little bogged down with a few injuries here there… There are still days 2 sort it out, but don’t see anyone coming in b4 the Reading game (but then who knows..) I really like to see another arrival & wouldn’t be suprised if something were to happen. All the best to the Reserves 2night & I’m sure the preseason friendlies have helped some of those players to stake a claim to the 1st team on Sun. Y not? They’ve beaten numerous Premiership & Championship opp. so there’s nothing to fear for them. I think we look in good shape both on and off the pitch. So if we fans can keep our expectations in check and based on reality we may well be in for a decent season. So good luck to the boys and Colin this weekend and bring it on ! Apparently Stephen Hughes has gone to Walsall, after we refused to meet his wage demands. He’s now with Walsall in League 1. Am I missing something here. He is a proven Premiership player, who would have been an excellent addition. This seems to suggest either Walsall have broken the bank to sign him, or we weren’t that interested! Seems to be we’ve missed a trick here. On Ben Watson, he wants to stay in London, so there was no realistic chance of really signing him. News on Sky – Best is out for a couple of weeks…. Manager not happy as the player was having a good pre-season… Twist of fate or pure damn luck?? Besides that, I am all excited about the premiere given that I will be there for the first time in an opening game! Look at Bridgford to spot a yellow 90s shirt (Labatts and stuff) cos I think I’ll be the only one wearing it! U REDS! Let’s give the Royals an idea of what we’re all about this season! See you all there on Sunday! PS: And YES! The Reserves have just equalised! Let the good times roll! I was just wondering if there is any truth in the rumour of chris cohen coming to us!! !there have been rumours on a number of are boards about this as he was seen around prenton park and was ment to have been seen with ronnie moore just wanted to know if any of you know inside info that would help!! Absolutely not a hope in hell, mate. He’d cost you over a million. we can afford because are chairman ahas got the money they have always said that but want spend it! !Wheres there money from when peter johnson sold everton?? I can’t see it, even on loan; he’s a key player for us next season – this rumour first surfaced a while back, I’m pretty confident it’s nonsense. I hope it is nonsense. He’s an integral part of our team, one of our best players last season. And my eldest has got his number and name on his shirt, too! Im a bit disappointed, Calderwood says its because he doesnt want to break the wage structure while that makes sense you have to wonder how much hes on around £5,000 ? rumours surfaced a few days before we signed Cole that we were going to sign him for £25,000 a week. 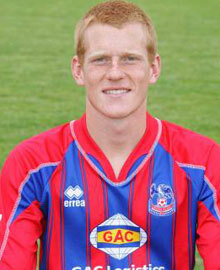 I really rate Watson and surprised Palace are selling him he wouldve been amazing with either Moussi or Cohen.